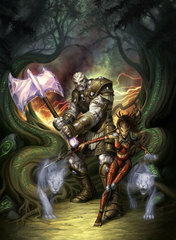 Features: Very strong, big axe, deals big damage, can break stuff (like troll doors), rages. Background: From the Pictish Highlands. Traveled south when tribe left him behind after breaking a leg. He saved the dockalfar Tazrak from being sacrificed by others of his kind in 611 A.D. and the two adventured together in the realms of North and South Rheged for several years until being recommended to the king of South Rheged by Bedwyr (a wizard they saved from Saxons). They have now been in the service of King Llywarch for around two years. Appearance: As typical goliath, with greataxe of pink crystal. Also has pink crystals embedded in his armor and harness. Personality: Typical goliath, loves a challenge, risk-taker, daring, strong connection to nature - especially stone, likes to keep fit. Gaming Goals: 1. 'Avalanche' to advance. 2. Magic Armor to Advance. 3. Gain Belt of Feral Might. Features: Exceptionally stealthy, dextrous & acrobatic, charismatic, carries many daggers inc a flaming one, has a goat figurine of wondrous power, hard to focus on from several paces away (his image blurs due to magical cloak). Background: Grew up in the Perilous Forest in the northwest of North Rheged. Learnt his father's assassin skills and swordplay from the clan's blade master. He was saved by the goliath Kavaki from being sacrificed by others of his own kind in 611 A.D. and the two adventured together in the realms of North and South Rheged for several years until being recommended to the king of South Rheged by Bedwyr (a wizard they saved from Saxons). They have now been in the service of King Llywarch for around two years. 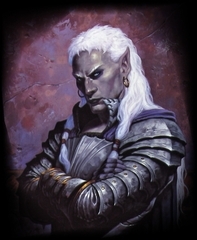 Appearance: Typical drow (wears dark, hooded cloak to conceal his features), red eyes, scar from left shoulder to right hip, facial tattoos, dangling yellow gem earrings. Personality: Cautious, suspicious, arrogant, proud, deceitful. 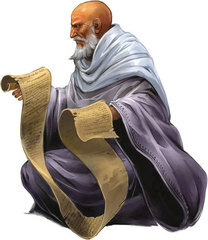 Features: Exceptionally clever/smart, old, wise, likable, knowledgable, carries a thunderwand and magical tome and orb. Background: Born 67 years ago under a bad omen (wolves attacked his village the day he was born) Tadhg has spent most of his life in South Rheged. Spending his youthful years as a soldier in a small mountain caer (Het) he sought out employment in King Llywarch's army when it was abandoned. At Caer Brem Tadhg instead was taught wizardry. After years as an advisor he grew bored and served on the front line as artillery and was assigned to the warband of the Prince Eiddoel. Upon retiring back at Caer Brem Tadhg came under the influence of a new arrival; a harkrinn storm priest named Stormclaw. Tadhg went on to be ordained in the church of Taranis and molded his magic into a storm theme. Stormclaw then convinced Tadhg to take up adventuring life once again. Appearance: Robed, bald with white beard, fit and strong for his age. Personality: Loyal, faithful, altruistic, negotiator, loves storms. Features: Can fly short distances, exceptionally wise, carries a thundering spear, wears special elven-made magical braidmail, extremely perceptive and insightful. Background: Grew up in the Kingdom of Glastening in Llyonesse to parents that were devout followers of Taranis. He journeyed north after killing a Saxon that was threatening his father when there was a truce. He arrived in Caer Brem in 608 A.D. and joined King Llywarch. His teachings of the storm god were very popular with the troops and soon he established his own temple outside the caer walls. The wizard Tadhg was one of his first converts and the two became close companions. Was happy to be called up to serve in a special warband for the king and convinced Tadgh to come out of retirement. 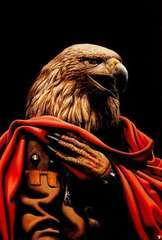 Appearance: Noble hawkman, short torso, solid legs, red cloak, spear, penetrating golden eyes, elven braidmail. Personality: Loves storms, loyal, honorable, warlike, enjoys conversation & song, despises betrayal, dislikes gambling. Gaming Goals: 1. Lvl 13 Att Power Remorse (DP) (replace Lvl 1 Shield Bearer). 2. Also at Lvl 13 retrain Utility lvl 6 Spirit of Healing to Bastion of Health. Features: Amazing archer, extremely dextrous, can store items (including his bow) in his magical gloves, magical bow can shoot arrows that phase through obstructions. Background: His tribe fled lands that are now part of Mercia and settled in the elven community of Solania near the border of North and South Rheged. 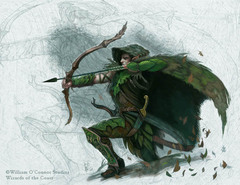 Assigned to another elven archer, Rolen learnt the use of the bow on regular patrols serving the King of Rheged. Thinking he would be placed in charge of the snipers when the leader died, Rolen was surprised when he was instead assigned to a small warband comprising of the local priests of Caer Brem and two oddballs (the goliath and dockalfar). Appearance: Green elven woodland clothes. Personality: Helpful, honest, doesn't judge. Gaming Goals: Lvl 13 Att Power Pugilist's Arrow (replacing lvl 1 Double Wasp Sting). Features: Undead elf, still dextrous, acrobatic, stealthy, focussed combatant, teleports himself and enemies around. Background: Mostly unknown. He knows a being called the Lord of Frost has given him another chance at 'life' and he knows he has a greater destiny to fulfill - he is just not sure what it is. He is known as the "Ghost of the South" in South Rheged. The warband of other PCs saved Riven from a Angle hunting party and Tadhg recognised him as his old elven adventuring companion, Karasin. The name is unfamiliar to Riven, but he joined their group, feeling this is somehow linked to his destiny. 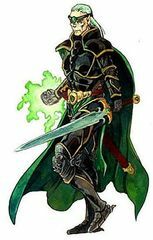 Appearance: Pale skin, sallow, black and green clothes and leather armor, longsword, crossbow. Personality: Cold, unemotional, quiet, eerie. Gaming Goals: Lvl 13 Attack Power: Sequestering Word (changing damage type to cold). (Replace Lvl1 Shared Madness).